Beautifully engraved certificate from the Northwest Airlines Corporation. This historic document was printed by the Merrill Company and has an ornate border around it with a vignette of the company logo. This item has the printed signatures of the Company’s President & Cheif Executive Officer and Secretary. Northwest Airlines Corporation is the parent company of Northwest Airlines, Inc. Northwest Airlines, Inc., generates more than 95 percent of Northwest Airlines Corporation's operating revenues, totaling more than $11 billion in 2000. 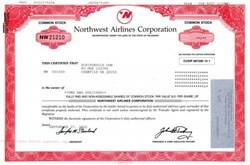 Northwest Airlines Corporation's stock is widely held by institutions and individual stockholders, including employees. Its stock is traded under the symbol NWAC on the NASDAQ National Market System. Northwest Airlines is the world's fourth largest airline and is engaged principally in the commercial transportation of passengers and cargo. Northwest Airlines began operations in 1926 and is America's oldest carrier with continuous name identification. Northwest Airlines operates substantial domestic and international route networks and directly serves more than 750 cities in 120 countries on the continents of North America, Asia and Europe. In 2000, Northwest had more than 60 million passengers and flew over 79 billion passenger miles. Express is a regional carrier operating flights in the Memphis area under the Northwest code. Express is a wholly-owned subsidiary of NWA Inc., a wholly owned subsidiary of Northwest Airlines Corporation. MLT Inc. is among the largest vacation wholesale companies in the United States. In addition to its MLT Vacations charter program, MLT markets and supports Northwest's WorldVacation packages and offers leisure fares to several domestic and international destinations. Northwest WorldVacations feature discounted scheduled air packages via Northwest Airlines and KLM Royal Dutch Airlines to destinations throughout Asia, India, Canada, the Caribbean, Europe, Mexico, and the United States. Northwest PARS, Inc. holds the airline's 34 percent investment in WORLDSPAN, which operates and markets a computer reservations and passenger processing system for the travel industry.